Kim Kardashian and Nicole Richie at age 13 bring back sweet Dr. Pepper lip balm-scented memories of fluffy pens, flared jeans, smiley face binders, inflatable furniture and Alanis Morissette cassette tapes. 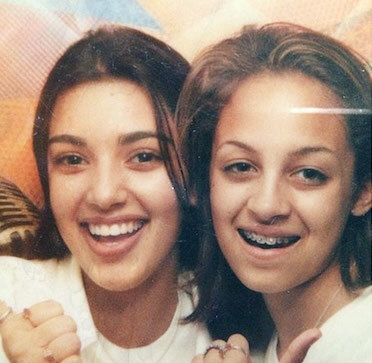 Kim posted a picture of her and Nicole being “oh so cool” for throwback Thursday. Even with braces and baby fat, these two are sadly a lot cooler than I was at that age with unwashed bird nest hair and gangly skeleton arms. My fondest memory of the ’90s was relishing the fact that I couldn’t possibly get more awkward, but I was more wrong than an unheated toilet in a Kardashian guest house. If only I had a crystal ball back then to warn me about the adult acne, blonde mustache and increasing fear of stupidity I would acquire as I approached 30.